In order to run the Games, we need 3,500 volunteers to help manage the event. 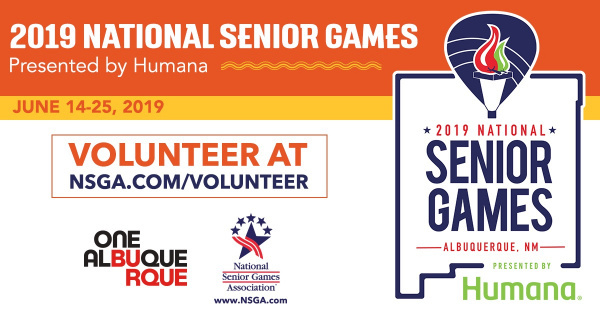 Volunteers can sign up at www.NSGA.com/volunteer and pick their preferred date, time, task and venue. We need hospitality and check-in, score-keepers and more! The event is held every two years across the United States. Albuquerque won a competitive bid process to host the Games in 2019. This will be the first time it has ever been held in New Mexico. Athletes will compete in over 20 sports at venues across Albuquerque, Santa Fe, Bernalillo and Cochiti Pueblo. All volunteers will receive training, a handbook, a commemorative T-shirt, access to our Volunteer VIP Hospitality Suite and more! For group volunteer activities, contact Brian Morris at [email protected] or (505) 414-9332.